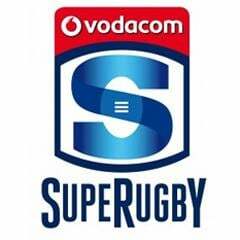 Pretoria - Handré Pollard became the first Super 15 player past the 100-point mark this season the bulls defeated Crusaders 31-19 at Loftus Versveld Saturday. The Springboks 2015 World Cup flyhalf contender kicked two conversions and four penalties from nine shots at goal for a 16-point contribution at Loftus Versfeld stadium. Pollard tops the points scorers' chart with 108 -- 18 more than national-team rival Patrick Lambie from the Coastal Sharks, who was rested this weekend. He played down his personal role after receiving the man-of-the-match award as the Bulls achieved a fourth straight victory after beginning the season with two losses. 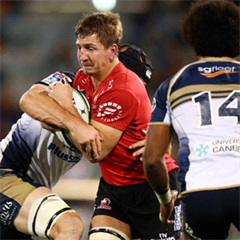 "It was a great team effort," said the 21-year-old successor to Loftus legend Morné Steyn, who is spending the twilight years of his career at French outfit Stade Francais. "And it was a great privilege for me to pit my wits against Dan Carter, the best fly-half of all time." A try each from right-wing Francois Hougaard, inside centre Burger Odendaal and substitute lock Grant Hattingh completed the Bulls' total. Veteran All Blacks and Crusaders flyhalf Carter gave a flawless goal-kicking performance with one conversion and four penalties and giant Fijian left-wing Nemani Nadolo scored a try. Victory lifted three-time champions the Bulls two places to seventh on the southern hemisphere inter-provincial combined standings and second in the South African conference. Record seven-time title-holders the Crusaders dropped one place to ninth overall and find themselves in the unfamiliar position of being only fourth in the New Zealand conference. Billed as the match of the seventh round, the teams fully fulfilled expectations with 80 pulsating minutes of top-class rugby. It also compensated a worldwide Super 15 TV audience after the Sharks overcame Australian outfit Force two hours before in a lack-lustre, error-strewn match. "We are very happy and very tired." admitted a visibly exhausted Bulls No. 8 and skipper Pierre Spies, a returnee this year after missing almost all of last season through injury. "A victory was essential from this game -- but difficult to achieve because Crusaders are such a quality side. "It was a great team effort although it helps a lot to see Handre kicking all those points week after week." All Blacks No. 8 and Crusaders skipper Kieran Read said his team produced a tremendous effort without securing even a losing bonus point. "We made a hell of an effort only to be let down by poor execution and ill discipline," he confessed. "Our plan was to keep the ball moving to try and run the Bulls ragged, and we did that well at times. However, the execution was not there." 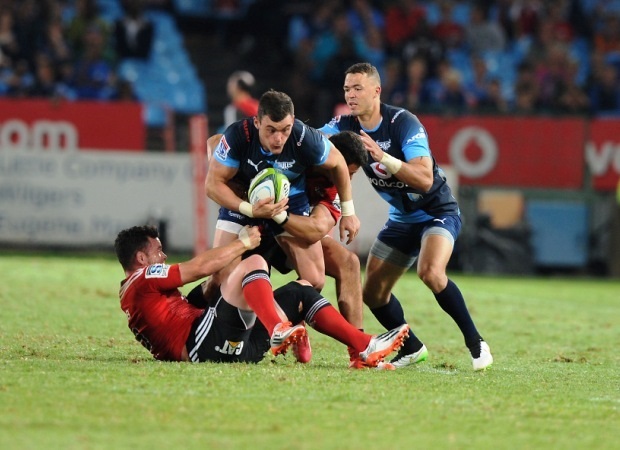 Bulls led three times and the Crusaders twice in a see-saw first half that ended 18-16 in favour of the hosts. The South Africans had stretched the advantage to five points when the decisive score came on 66 minutes. A Carter pass was intercepted by Hattingh, who made a long gallop to the try-line and held off two Crusaders to dot down.